I was manning the Home Builders Association booth at the Cleveland Home and Remodeling Expo at the Convention Center. The big draw for the day was HGTV’s The Property Brothers, Jonathan and Drew Scott. 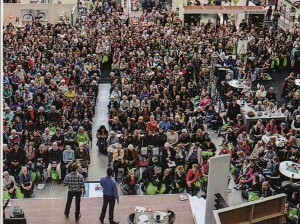 I had no idea these or any HGTV personality could draw such an impressive crowd. There was standing room only. They are the rock stars of real estate and remodeling and when they came on stage the crowd went wild. What they say makes a lot of sense and I have written about each of these items to get a home ready for sale. The reality is that if you want to live in an efficient home that works well for you and supports your lifestyle, the above five items will help you get there. Rather than wait to make these changes before you sell your home, make the changes now so you can enjoy your home. One thing that impressed me in the article was their attitude about what is important in the home. Rather than focusing on aesthetics like which countertop to have in the kitchen, they believe in investing in the infrastructure to make the most of the home’s energy efficiency (e.g., double paned windows and adequate insulation). They summed it up by saying “no one becomes attached to the collection of studs and a roof”. They become attached to the memories they make in their home”. I totally agree with them.